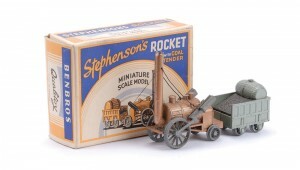 Although Timpo produced a variety of toys both metal, and later plastic, for this introduction to Timpo Toys I am concentrating purely on the metal vehicle element of the company. Timpo Toys Ltd. operated out of No.26 Westbourne Grove, London W2., the name of Timpo came out of ‘Toy Importers Ltd’ and was to become the Company Trademark, as the name implies an importer of toys rather than a toy manufacture and was founded in 1938 by Sally Gawrylovitz (1907-2000) a Jewish refugee from Frankfurt, Germany . With the outbreak of the Second World War importing became impossible and in order to continue Timpo began to manufacture for themselves. 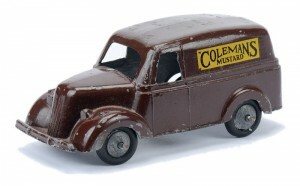 In saying that materials were scarce for toy production at that time, never-the-less four models were produced during those war years, namely the hollow cast MG Record Car and the diecast/zamac Streamlined Saloon, Pick-up Truck and Light Saloon. It wasn’t until 1946 that more models were to see the light of day. 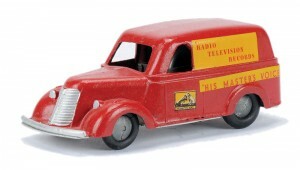 1946 -1947 saw the range grow with the addition of various racing cars / saloons / utility vans / commercial vehicles and articulated box vans and trucks. 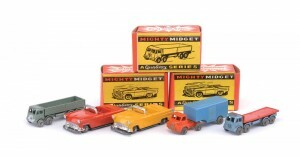 More saloons, trucks and vans followed from 1948 through to 1950 with the introduction of friction drive motors from 1948 into both existing and new models. 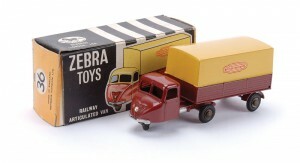 These later production models also saw an increase in the finished quality of the vehicles but sadly the ban in the use of zinc in the manufacturing process around 1951-’52 meant that Timpo discontinued all their diecast/zamac vehicles with some of the Timpo dies taken up by Benbros. 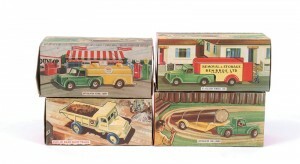 (AEC Slumberland / Bedford Commer Moving Van / Fordson Tractor amongst others). 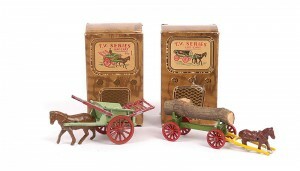 1953 saw Toy Importers moving production to Shotts, Lanarkshire, Scotland and changed its name to Model Toys but retained the Timpo trademark. By and large the Timpo range of vehicles were by any standards somewhat crude yet sturdy in their construction and perhaps for that reason are viewed today as being rather attractive in their simplicity. View for yourselves and make up your own mind. 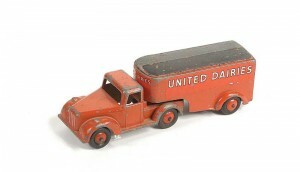 Below are two examples of Timpo articulated box vans in the livery of United Dairies and Pickfords both these would date to 1947. As you can see from the images the castings are the same. Simply a matter of different colourways and decals to effect a different model.